Perfect for making gifts for your family. 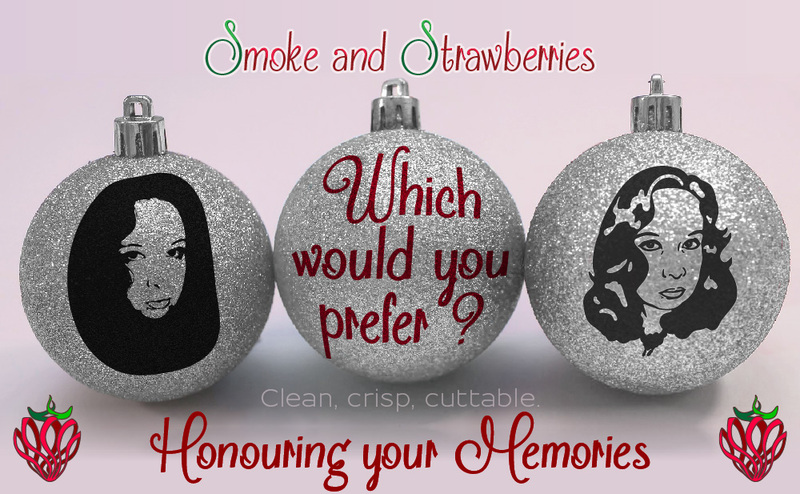 Your precious memories can be turned into single layer SVG files, This order page is specifically for lower detailed designs to be cut at small size suitable for baubles and Christmas ornaments. It is perfect for creating unique personalised gifts, memorials and keepsakes. People, children, pets, special objects anything can be traced and converted to a ready to cut file for you. This is a hand done, artistic process, it is not just a simple quick computer trace. The result will be more accurate if you are able to provide a good quality, well lit, high resolution original image. This is not essential as the hand tracing is an artistic process, however I will have to guess what the person originally looked like if their face is now just 100 blurred squares in a low quality image. These drawings are a creative art, and as such will always look a bit different to the original photograph and have a stylised nature as using only black and white, and nothing in between while trying to keep cut-able sized elements can be quite a challenge. I am willing to revisit images to make changes to ensure your satisfaction. I do need you to be highly specific as to what changes are needed. “The shading on the chin makes it look to big” is good ” something is a bit off” is not. You will be provided with a preview of the final sketch for approval before the conversion to SVG. I go over the final SVG and clean up nodes, check all the cut lines for anything too small to cut or too close together. It is important to me to get the easiest to cut design possible while still keeping everything looking great and not distorted. Other files types can be available, just ask and I will try my best, I may not be able to convert to all file types as some require specific software I may not have access to. But if you have a machine to cut with we can find a way. You can see examples of my hand traced photos here in the blog. Prices are on a per image basis due to the small cut size this is limited to a single person/pet/object. I need to know if you intend to cut for a light or dark background – as cutting a design in white, which was designed for black then the image will look like a photo negative. If you will be cutting for light and dark colours then you may need two versions. Standard turn around time is 3-5 days – with quicker option 48 hours turnaround available for an additional fee. If you are after a faster turnaround please contact me. Please note turn around time does not include the time for adjustments if they are needed.